Love love love this bird house! Fav! Whoa! That's a lot of snow! @nana Yes, Nancy, and it's only just begun. No telling how much more we will have between now and the end of April! :-) Our snow here in the Interior of Alaska is very dry and fluffy, however...so much so that you can't even make a snowball! So, it settles a lot over the winter. Such great composition and I love the pop of red on the bird house. Fav. Oh, I love this, Barb! Beautifully shot! It's a fav! Beautiful shot and great title! Love the bird house! Your title sums it up! Great shot with the red, white and blue! 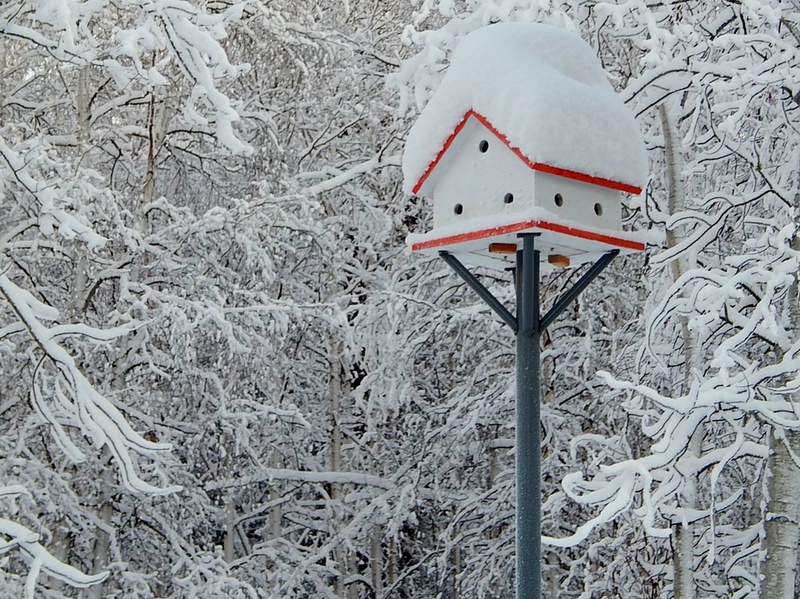 Love the pop of red on the wonderful birdhouse, perfect against all the white. So much snow! i love how the red trim pops against such a white world. Beautiful, although I do not envy you! @atwinfay Thank you so much, Sharron! @kbird61 @beckys @genealogygenie @sansjuan Thanks for coming by and for all your encouraging comments, friends! This is absolutely stunning, look at those branches! Fav, and congrats, so glad it's on the PP where it belongs! great ,snow on anything gets my vote. @palmilla @princessliz @tristansmum @buccleugh Thank you, everyone, for viewing my photo and for your great compliments! I like this photo, as well, but never dreamed it would land on the Popular page!!! What a super shot. Fav.